The MiniPlex-3 Series has a rich set of features and configuration options, enabling the user to tackle almost any NMEA bottleneck or interface problem. The configuration tool MPX-Config3 allows full configuration of the multiplexer and monitoring of NMEA data passing through the multiplexer. NMEA data can be routed from any input to any output. A default route can be set as well as specific routing rules for individual NMEA sentences. Computer data can be routed to any NMEA output, to be merged with other NMEA data or to override this data. This enables automatic switching between computer based navigation and GPS/instrument based navigation. A flexible NMEA filter can be configured to pass or block specific sentences from each input channel. This greatly reduces the chance of an overflow and the resulting loss of data. Many GPS receivers for instance, transmit an abundance of sentences every second, accounting for 85% of the available bandwidth of an NMEA 0183 port at 4800 Baud. By blocking unwanted or unnecessary sentences, bandwidth is preserved for other instruments. 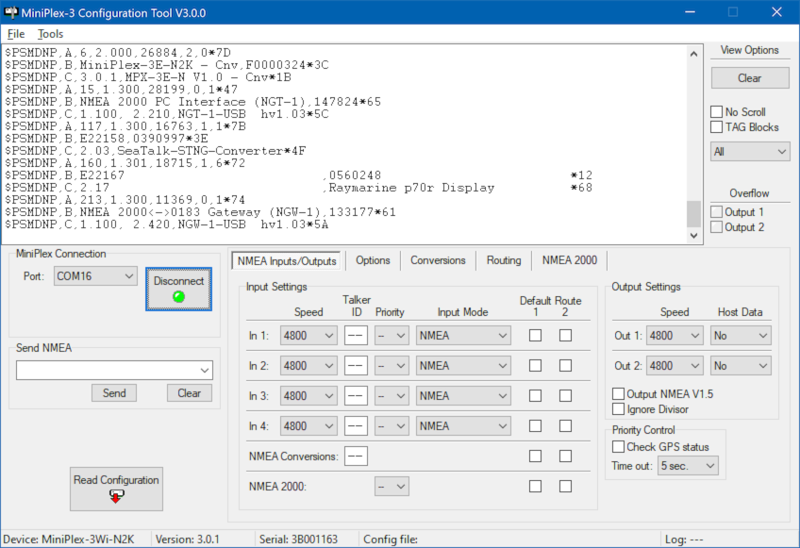 The filter can also be configured to reduce the rate of specific NMEA sentences. The MiniPlex-3-N2K models are equipped with an NMEA 2000 interface to connect to an NMEA 2000 backbone with other navigation instruments. The MiniPlex-3 will translate NMEA 2000 PGN’s (messages) into NMEA 0183 sentences and vice versa. This feature enables a seamless integration between NMEA 0183 and NMEA 2000 navigation devices. It also allows navigation software, which usually only supports NMEA 0183, to receive data from NMEA 2000 devices and to control NMEA 2000 autopilots. The communication speed of all inputs and outputs can be set from 4800 to 57600 Baud to allow connection of devices that operate at non-standard (4800 Baud) communication speeds like integrated weather sensors, gyrocompasses or AIS receivers and transponders. When Input 1 is set to SeaTalk mode, this NMEA input becomes a bi-directional SeaTalk port, offering conversion between the most common SeaTalk datagrams on a Raymarine SeaTalk1® network and their NMEA 0183 counterparts. These sentences are combined with NMEA sentences received on the other inputs. When Priority is enabled, SeaTalk data can be assigned highest or lowest priority. With Priority enabled, similar NMEA sentences on different inputs are only passed from the input with the highest priority. When for instance two GPS receivers are connected to inputs 1 and 2, and both transmit the same type of NMEA sentences, only those received on input 1 are passed. An adjustable time-out ensures that similar sentences from the GPS at input 2 are passed when the GPS at input 1 stops sending these sentences. Optionally, GPS sentences are checked for a valid status field, causing automatic switchover when the primary GPS looses satellite signal. An additional option to check the GPS status flags can be enabled to ensure that data received from a GPS which lost satellite reception is also blocked. This features adds an extra $MXSTN sentence or a TAG block to NMEA sentences to indicate on which NMEA input a sentence is received. Talker ID substitution changes the talker ID of incoming sentences. The talker ID can be specified for each input channel. This option is useful for software or instruments that expect a specific talker ID or to distinguish between sentences from two similar instruments.